Positano was our third and last stop on the Amalfi Coast, just a short boat ride up from Amalfi. 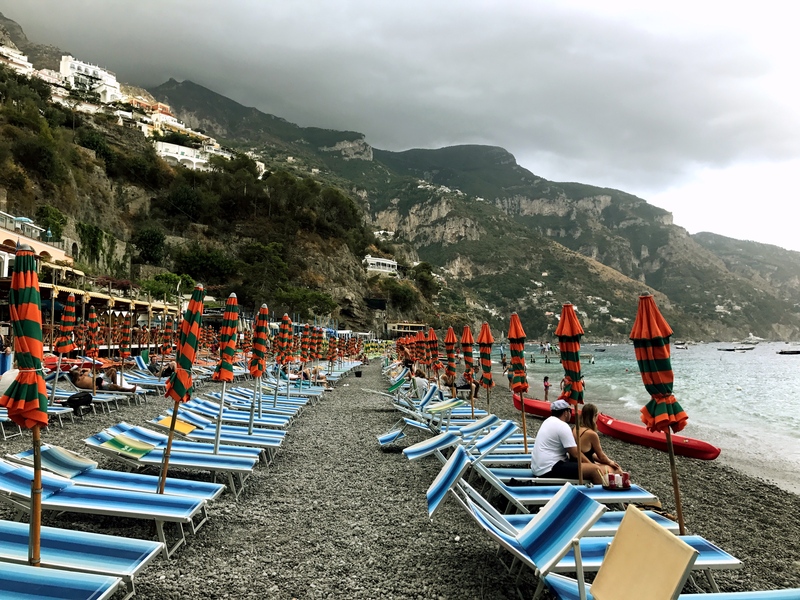 While once a port town in the Amalfi Republic – when Amalfi was the big deal in these parts – today Positano feels bigger and more important than Amalfi. 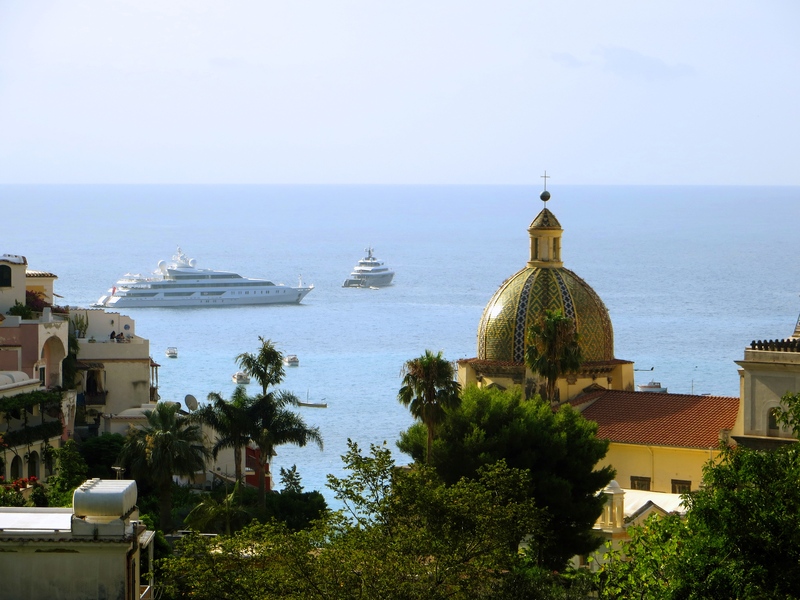 More tourists, more money, and certainly more yachts. More upscale. And more so than Amalfi its hotels and shops and bars and all that climb up from the coast into the surrounding hills, making for great views from many of the restaurants and hotels. While once prosperous, the town fell on hard times in the mid-19th century. And then the tourists discovered it. 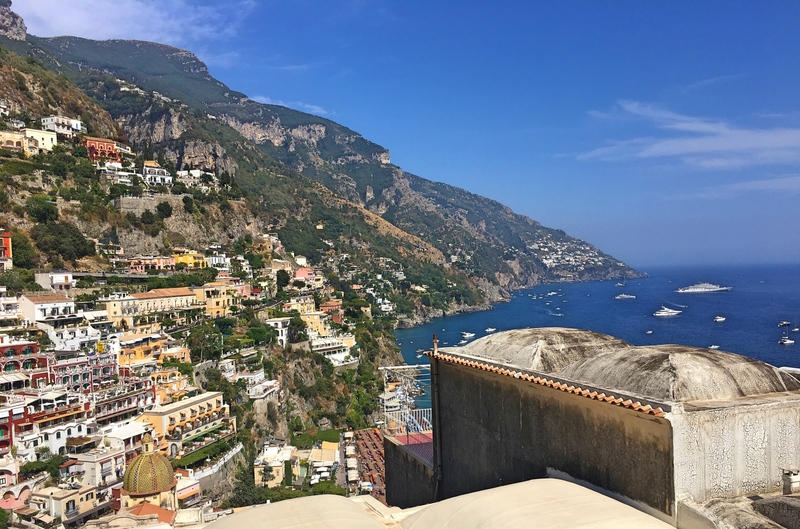 It took a while, but in 1953 John Steinbeck wrote an ode to Positano in Harpers – “Positano bites deep”, he wrote. “It is a dream place that isn’t quite real when you are there and becomes beckoningly real after you have gone.” – and the hordes started coming. For good cause, I might add as it’s a beautiful little city. The view from our hotel balcony. Not bad, though I tried to convince them to tear down that ugly building in the foreground. 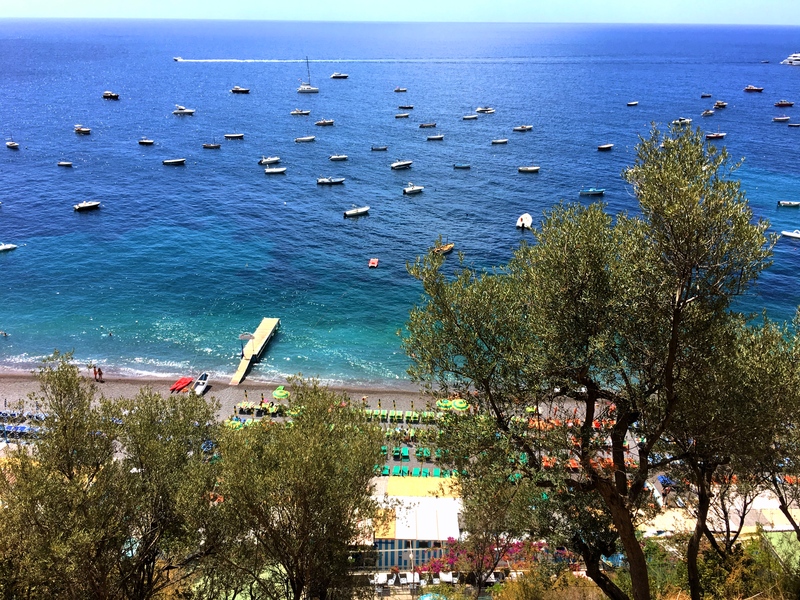 Once we got that behind us there were two big activities for us in Positano, the beach and the Path of the Gods. Our hotel suggested we go to a beach just slightly away from the main town beach and that turned out to work great for us with a lovely little restaurant up above the beach just a bit. Read, swim, read, eat, swim, sleep. Repeat the next day. The view down to our favorite beach. Lots of boats as you can see. 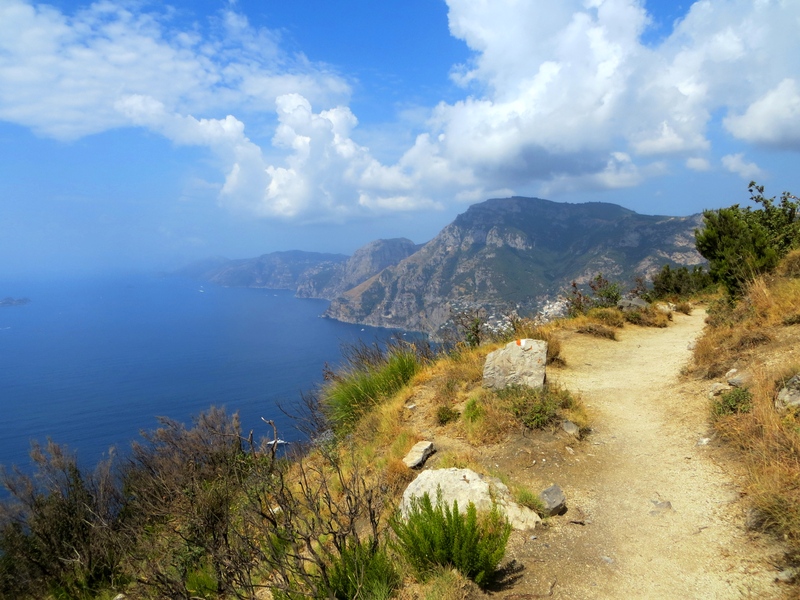 Since first planning this Amalfi Coast visit I’ve been excited about a hike called the Sentiero degli Dei, the Path of the Gods. 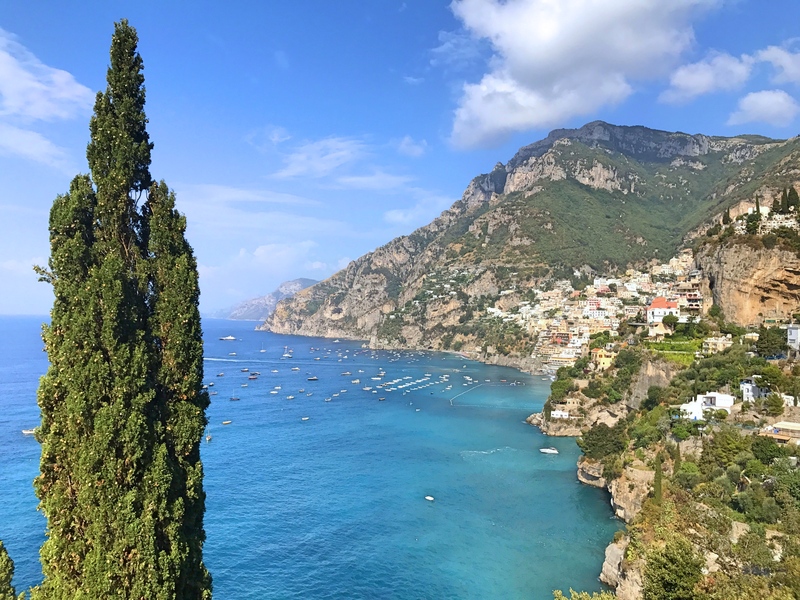 It’s a trail that connects an outlying village of Positano to another town high up above the sea. Once you get to the starting point it’s not that hard a hike, maybe a little under five miles of a modest up-and-down trail. I decided to walk to the start of the trail, though, instead of taking a bus, meaning that I had to climb the whole thing from sea level. Challenging, but ultimately beautiful. So after literally decades of wanting to go to the Amalfi Coast we’ve done it. It’s probably as beautiful as I’d hoped, but there are a few things that will stand out in my memory. Yachts. Big yachts. 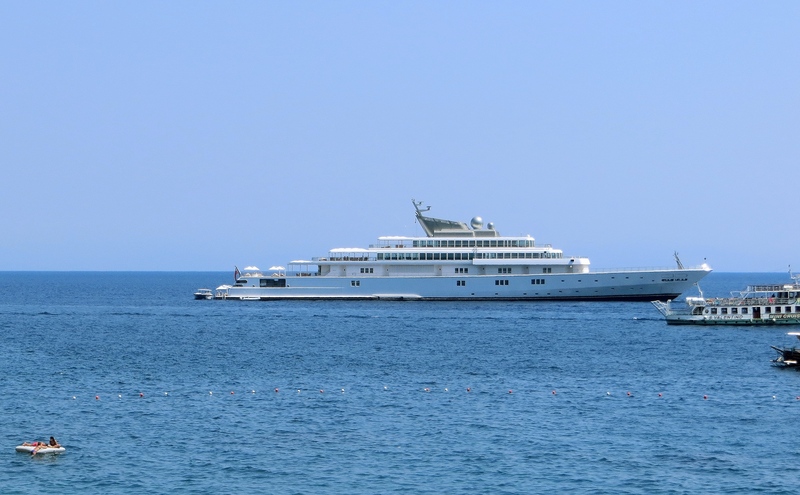 David Geffen’s massive 11th-largest-in-the-world boat was here, apparently following us. But even leaving that one aside you’d see other huge yachts, the kind that must cost $50 million or $100 million or whatever. Lemons, too, the biggest lemons we’ve ever seen, often two or three times the size of standard lemons. Looking down over Positano’s Santa Maria Assunta church with its tin-glazed pottery dome and David Geffen’s yacht in the distance. It made others look small, but many of them weren’t. And then there’s the weird two-fork-one-knife thing. 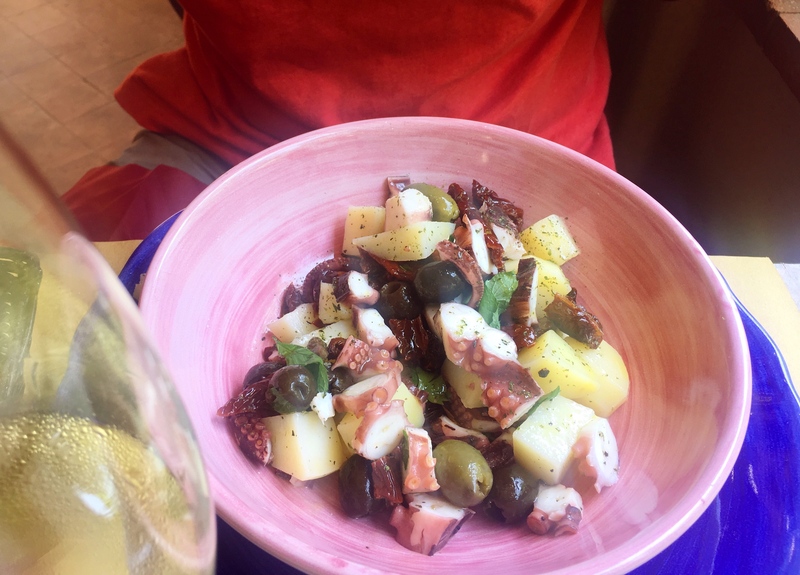 At pretty much every lunch and dinner – and I think it was literally every meal – you’d sit down to a table set down with two forks and one knife. We’d have an appetizer course and use one fork and the knife. They’d clean the dishes, including the knife and fork we’d used and then bring a new knife. It just seemed strange that every time there would be two forks and one knife. And then they’d replace the one knife. I’m sure there’s an explanation, but we never figured it out. From here it’s another boat ride out to Capri. It just keeps getting better. Our favorite beach. Very European insofar as there’s not a speck of sand to be seen and the chairs are pretty darned close together. But when the sun is out – and it did come out, even on this day – it’s close to heaven. The trail on the Path of the Gods was pretty easy to follow. You wanted to be careful not to fall, though, cause it’s a long way down. 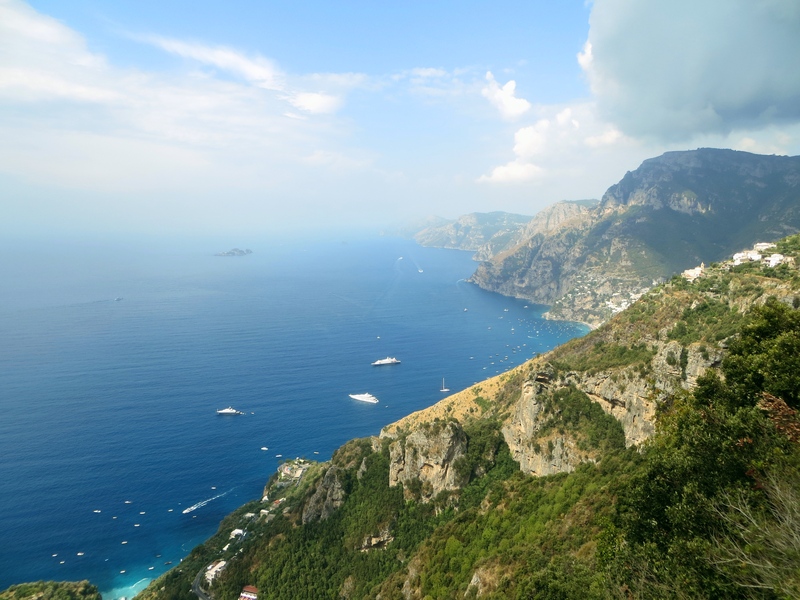 And one last shot from the hike, looking up the Amalfi Coast. 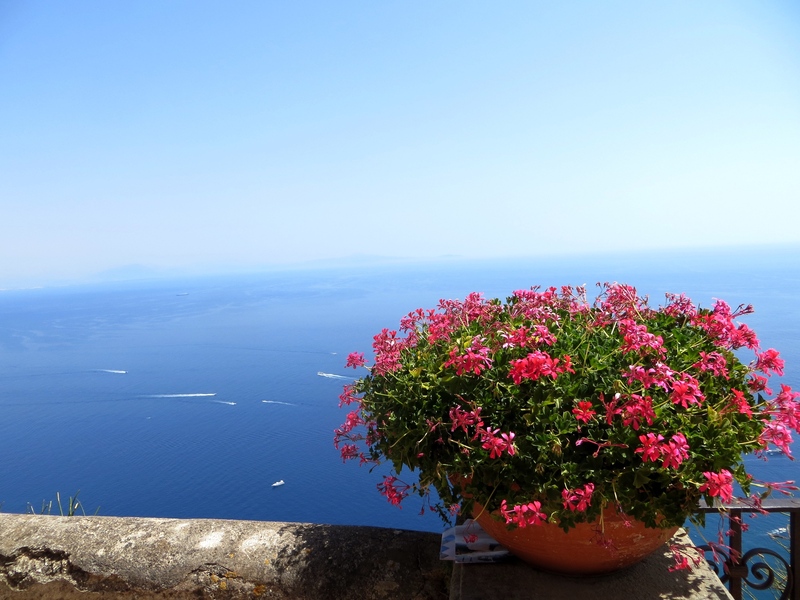 If it hadn’t been so hazy I’d have had a nice view of Capri but that’s OK, we’ll just go there and see it close up. 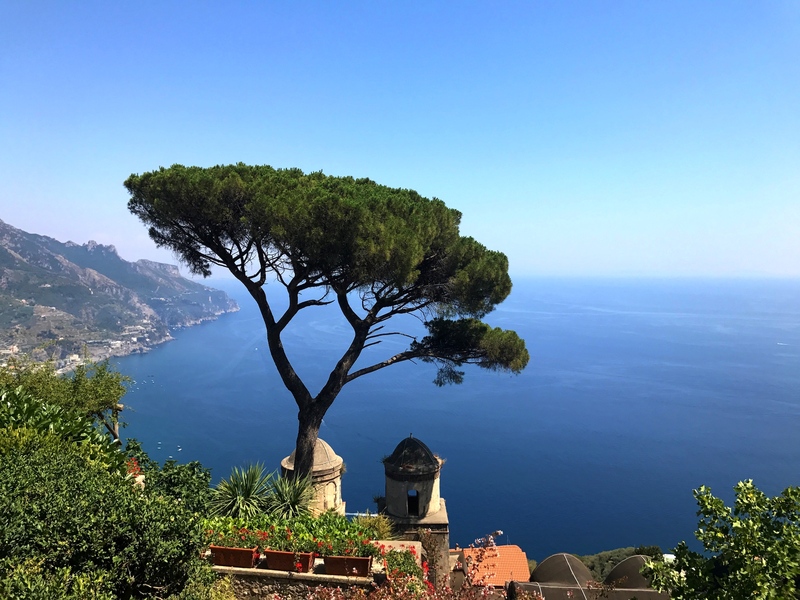 Our second stop along the Amalfi Coast was Ravello, a hilltop town of about 2,500 permanent residents and another UNESCO World Heritage site. 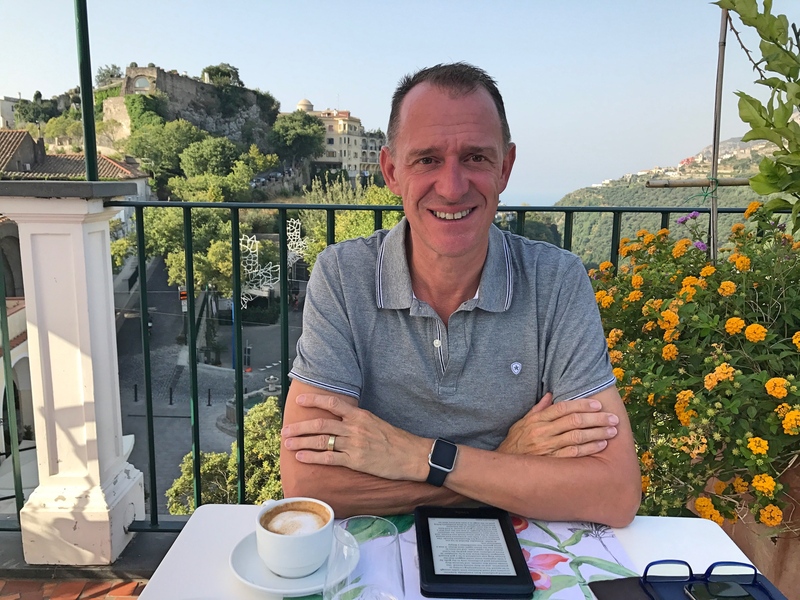 It was both a short journey, just 20 minutes or so by bus up the steep, steep cliffs from Amalfi, and a short two-night stop. 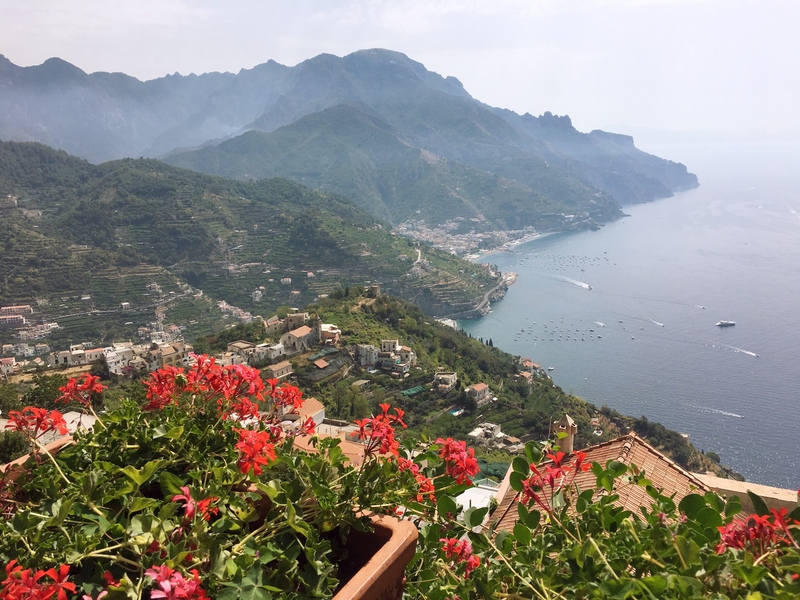 To jump to the main point, in Ravello it’s all about the views. They’re something. Once upon a time Ravello was relatively big and powerful. 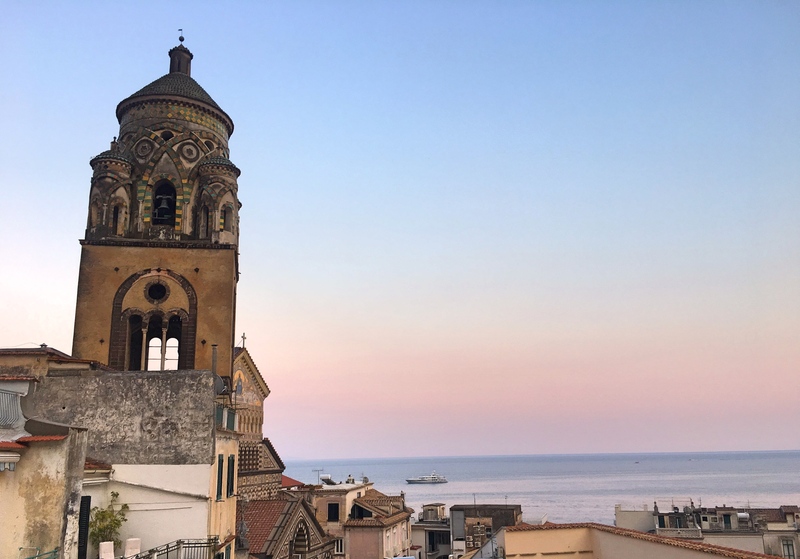 In the late 11th century Pope Victor III split the diocese away from Amalfi (to weaken Amalfi and its annoying alliance with the Moslem enemy) and made the city’s bishops subject directly to the Vatican. At it’s peak it held a population of about 25,000 which is pretty remarkable when you see just how hilly it is and how difficult it is to even imagine that many people up there. Its heyday was relatively short, though, as the maritime power Pisa destroyed the city in 1137 after which a long period of decline set in. What remains today, though, is pretty remarkable. 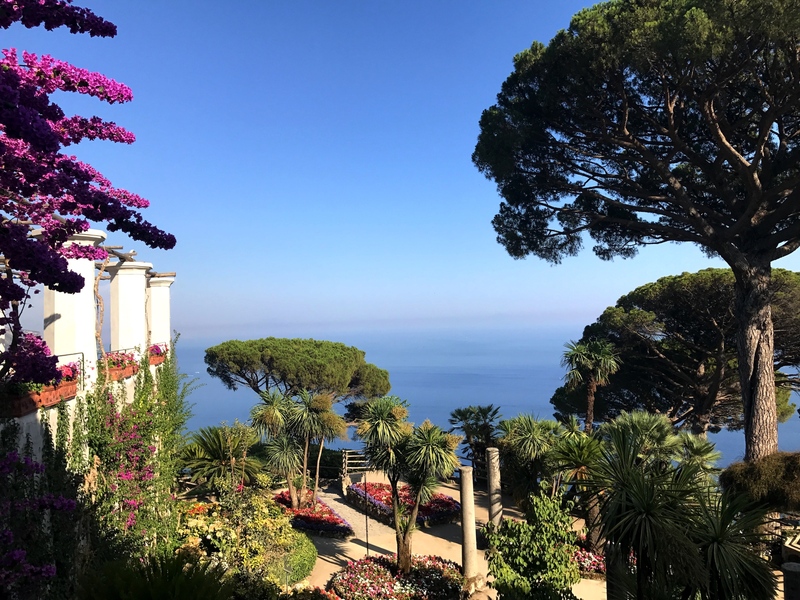 Some of the great buildings and even gardens from Ravello’s glorious past remain, giving the town a grandeur that far exceeds what you would expect from a town of that size. The result is that Ravello is elegant and refined, particularly in contrast to Amalfi’s more touristy brashness. To be sure, there are no beaches way up here and I like beaches as much as the next guy, but the views make up for it. And while there are certainly a bunch of tourists, most of them are making brief day-trips up to the town leaving it peaceful and calm in the evenings. I loved our brief stop here. Mark was a bit bored, but for me it was obvious why someone like Gore Vidal – American political figure, novelist, and essayist – would spend years living here before he died. 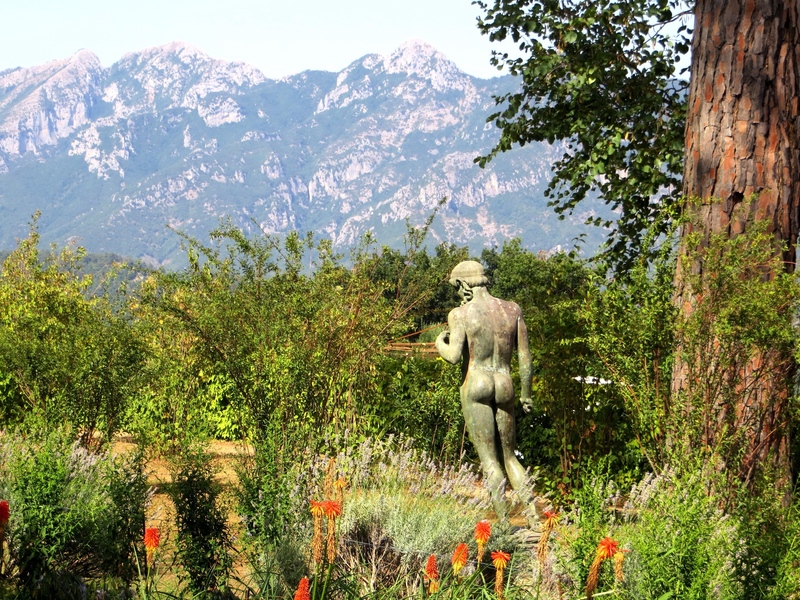 Two grand old residences – Villa Cimbrone and Villa Rufolo, dating from the 11th and 13th centuries, respectively – are tourist destinations today with beautiful gardens and stunning views over the coast. For me, an afternoon spent reading in one or the other is a pleasant way to spend my life. 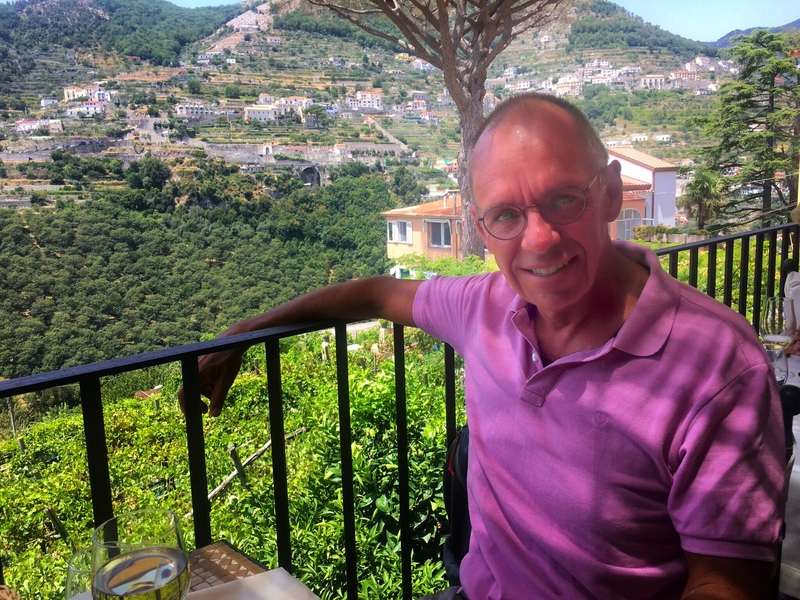 Breakfast at our hotel, La Moresca, was on a rooftop terrace. Very civilized. Two days was plenty for Mark, while Gore Vidal spent years here. 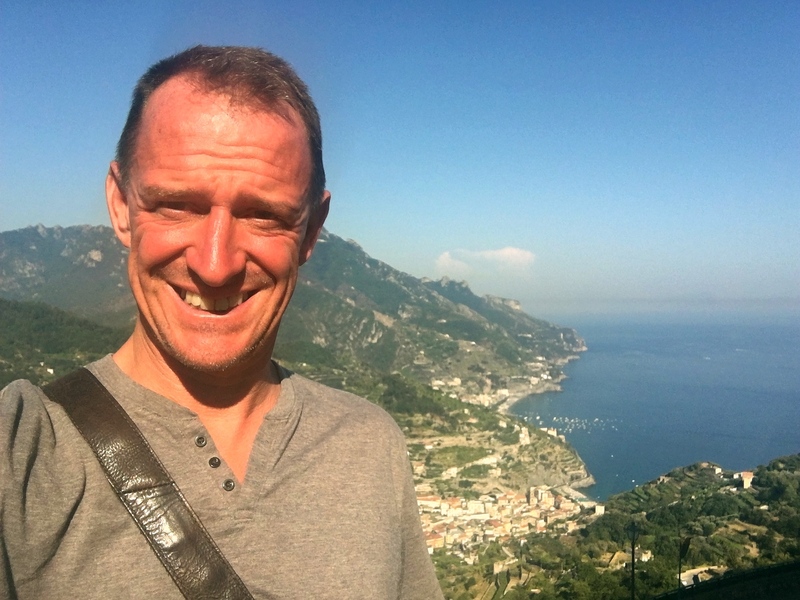 I’m somewhere in the middle and I look forward to coming back for a longer stay, but from here it was back down to Amalfi to catch a quick boat further up the coast to Positano. 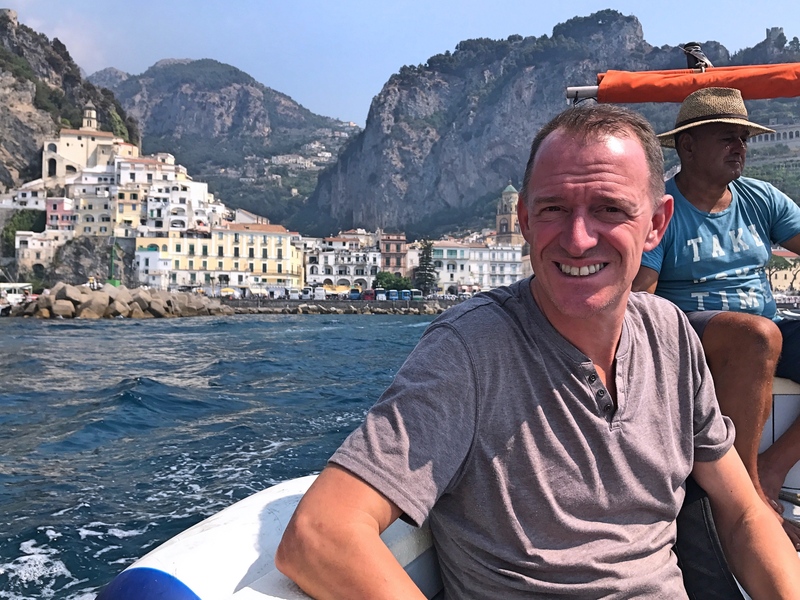 It’s crazy that as much as we have traveled, and in particular as much as we have traveled in Italy, neither Mark nor I have ever been to the Amalfi Coast. It is, after all, one of the world’s great holiday destinations, a UNESCO World Heritage Site, and – here’s the big one – the filming location for Wonder Woman’s Amazonian birthplace, Themyscira, in the current film Wonder Woman. Well, finally, that huge gap in our world travels is over. 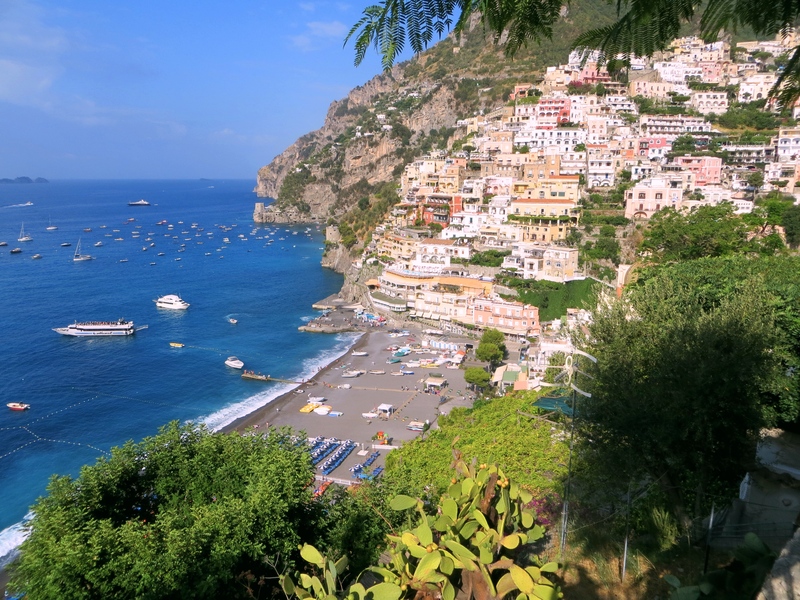 We’re going to spend nine days here on the Amalfi Coast, three in Amalfi, two in Ravello, and four in Positano. 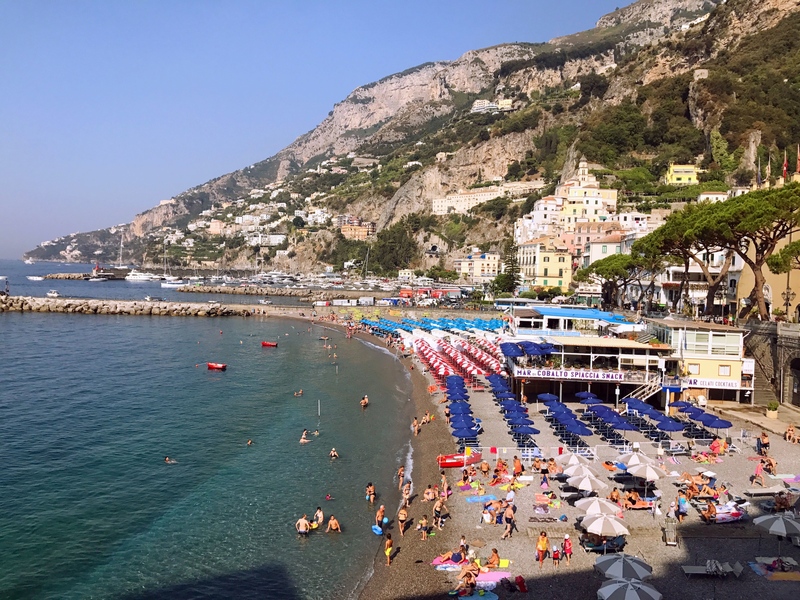 After that it’s Capri and Naples, but for now here’s what we found in Amalfi. While today it’s a tiny village of less than 5,400 residents that’s been turned over to tourism it was once, along with Genoa and Pisa, one of Italy’s great and powerful city-states. At the turn of the first millennium it was a major trading power with a population of perhaps 80,000, one of the few Christian states that traded freely with the growing Islamic state. That didn’t stop them from participating in the Crusades, of course, and during the appalling Fourth Crusade – when European powers attacked their host, Christian Constantinople instead of trying to free Jerusalem from Moslem control – they captured the supposed relics of St. Andrew the Apostle and carried them back to Amalfi. Today those very same relics lie in Amalfi’s Cathedral of St. Andrew. David Geffen’s yacht, the Rising Sun, was anchored in the bay the whole time we were here. It was huge but according to one reference I found online accommodates just 16 guests. At the same time it has a crew of 45. I think you have to be a billionaire several times over to afford something like that. And what about today? Today there are tourists. Lots and lots of tourists, including some pretty fancy ones. We noticed right away a big boat anchored in the bay and asked around what it was. It seemed too big to be a personal yacht but too small to be a cruise boat. With a little research Mark learned that it was indeed a personal yacht, one owned by music- and movie-producer David Geffen At 454 feet that sucker is the 11th largest yacht in the world. As Hollywood royalty Geffen hosts all the big names on it – Oprah, Tom Hanks, Bruce Springsteen, Leonardo DiCaprio – but I first heard of the boat just a few months ago when no less than Michelle & Barrack spent part of their post-White House holiday cruising French Polynesia on the boat. We didn’t see any of them, but the boat was anchored there the whole time we were in Amalfi. 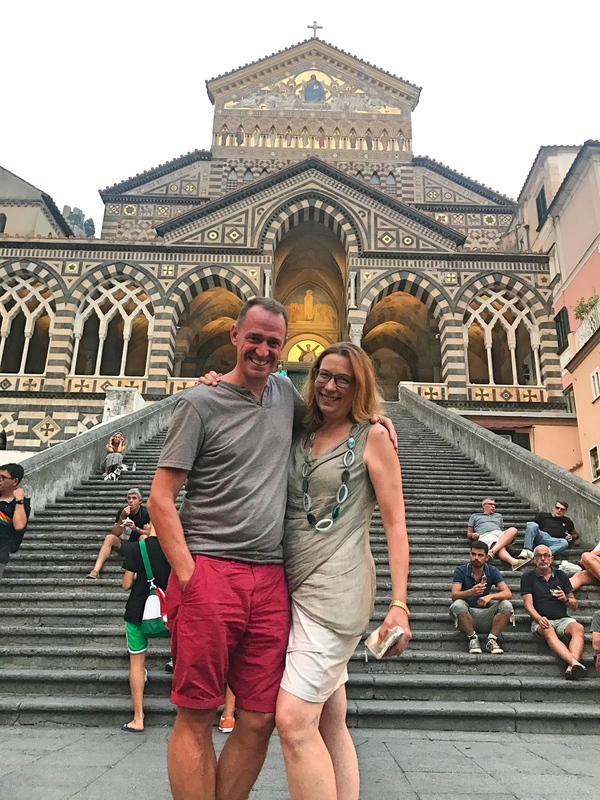 And what did we do in Amalfi? I’d read that the town beach was worth avoiding so the first day we took a little boat to an isolated beach maybe 20 minutes up the coast. It was fun, there was a nice restaurant called Da Teresa, but not really worth going back to. I was particularly annoyed when the waiter at lunch pointed out that service is not included on the bill. Service is always included in Italy and Europeans never tip anything more than spare change; this was just an attempt to drag a few extra bucks out of guilty Americans. So the next day we went to the town beach instead and I thought it was really a lot better: a bigger beach, easier to get into and out of the water, and a lot more lunch choices. 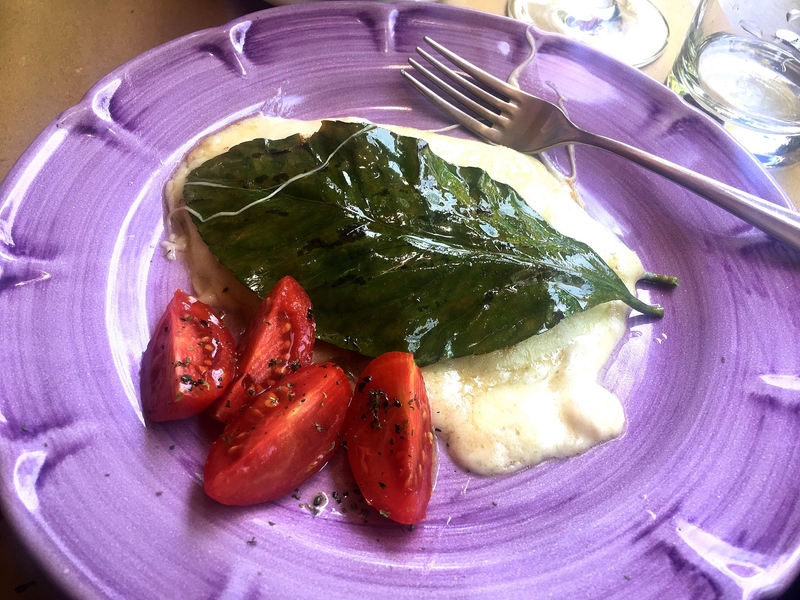 Of course eating is a big part of traveling in Italy and we had a couple of good meals. At one place called L’Abside we had what seemed like the best eggplant parmigiana I’ve ever had. 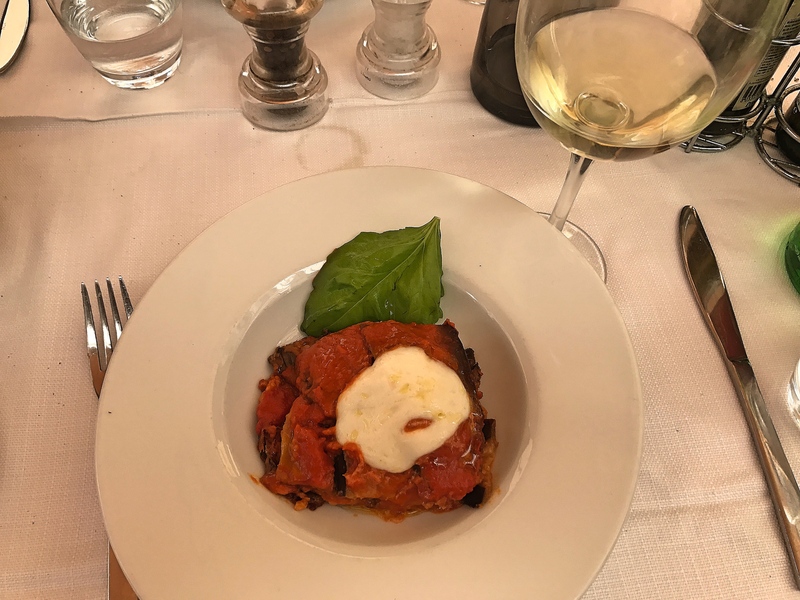 It made me realize that if I travel France looking for the perfect steak tartare I should travel Italy looking for the best eggplant parm. Except I may have already found it. And then there was one last visit with Lisa, Mark’s old college friend studying down in Salerno and finishing up her five-week Italian sojourn. She took the boat up from Salerno on our last night and we shared wine until it was time for her to go back and us to find dinner. All in all Amalfi was a fun little town. Probably a little too touristy for my tastes, just too crowded and all. 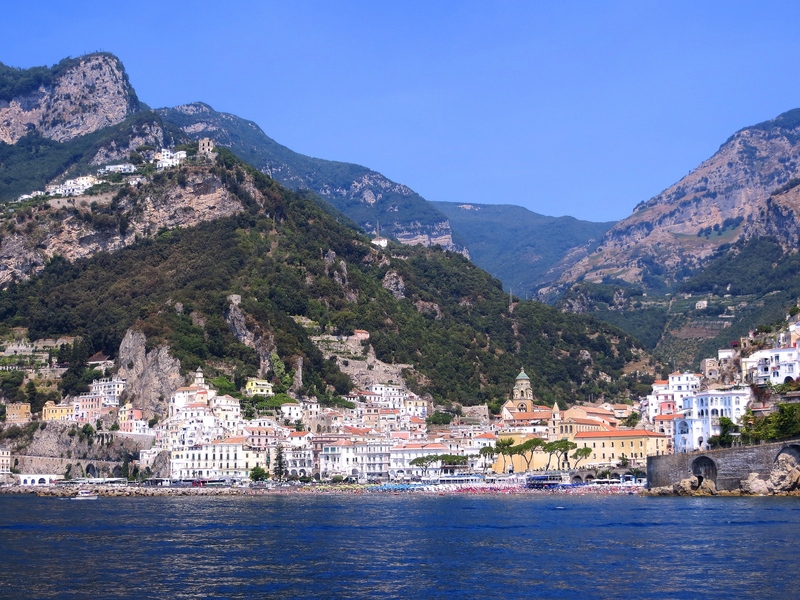 But it certainly is beautiful and it was a good start to this exploration of the Amalfi Coast. Next stop, Ravello. 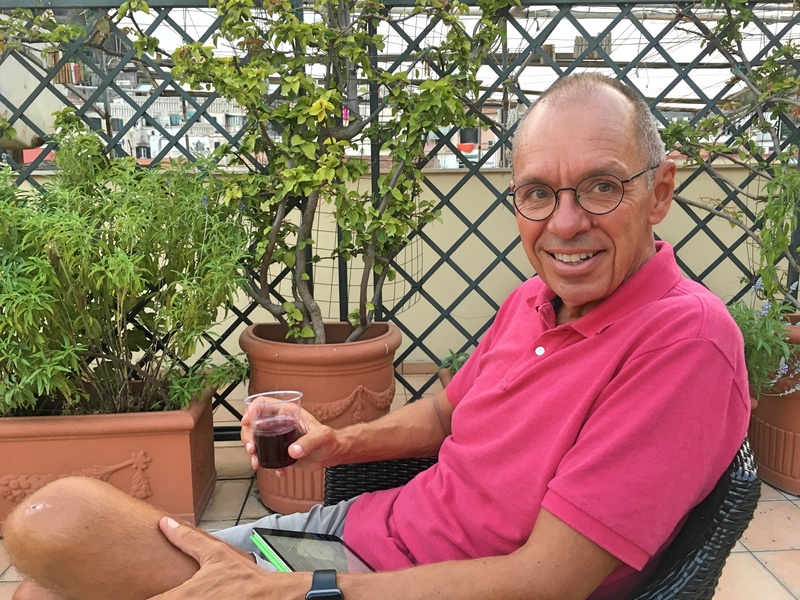 Enjoying a glass of wine on the terrace before going out to dinner. I suspect that on my iPad there I was reading something about the train wreck in DC these days.